Norelle Jacobs introduces Gabrielle Hansen (far right) and Janet Collard (centre) to give the Welcome to Country at the Official Opening of the ‘Koorah Coolingah’ exhibition, Katanning, 24th February 2006. Berndt Museum of Anthropology, The University of Western Australia. The Official Opening at Katanning of the exhibition ‘Koorah Coolingah: Children Long Ago’ on 24th February, 2006, was the culmination of more than a year of careful planning. It was the third component of a four year showcase of Aboriginal arts of the Kimberley, Western Desert, South-West and Perth. This program was devised by the Artistic Director of the Perth International Arts Festival (PIAF), Lindy Hume, in consultation with regional community groups, with liaison by Carol Innes. As I mentioned in a previous blog, A Long Way From Home, three of us had travelled to Colgate University in up-state New York to inspect the newly ‘rediscovered’ collection of Carrolup children’s art. We selected a number of works to borrow from the Picker Gallery for this regional PIAF exhibition at the Katanning Art Gallery, which was twinned with a further exhibition of works from the collections of the Berndt Museum, held in Perth at the Western Australian Museum. It was a big day for Katanning, and for Noongar people of the South-West. Hundreds of community members poured into town for the weekend event. Visitors from Perth and interstate joined the events. All accommodation in the town had been booked out months earlier; others crowded the temporary camping ground set up at the football oval. In addition to the ‘Koorah Coolingah’ exhibition, the Noongar Boodja Gallery in the old Council Chambers had mounted a special exhibition of contemporary Noongar artworks in the Town Hall. Katanning school children practised their dances to accompany the Official Opening. The three children of Noel and Lily White were there, too: Noelene, Janette and Ross. And Pat and Courtney Nunn, who were instrumental in initiating the Carrolup Project. The last surviving Carrolup child artist, Milton Jackson, was also present on the stage. The stage was set. The Master of Ceremonies for the evening, Narelda Jacobs, introduced the two women who would make the Welcome to Country: Gabrielle Hansen and Janet Collard. Gabrielle had been involved with the Carrolup Project with me since way back in 1985. Ezzard Flowers spoke, and Richard Walley danced. It was a magical event. There were many tears. And laughter, too. 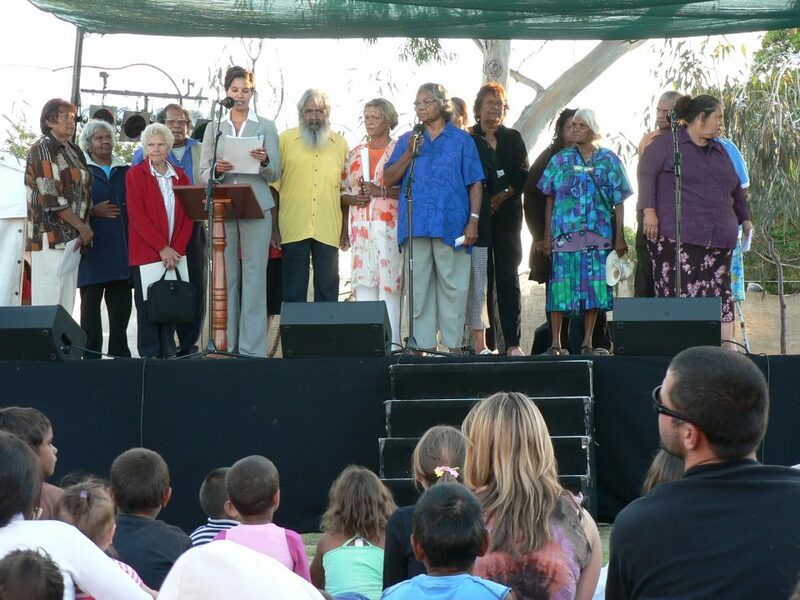 The Official Opening of ‘Koorah Coolingah: Children Long Ago’ drew an enormous crowd of Noongar community members, families and many Wadjella (white people) to Katanning. Master of Ceremonies Norelle Jacobs introduces Gabriele Hansen and Janet Collard to give the Welcome to Country. Filmed by Nell Ustundag in Katanning, Western Australia, on 24th February 2006. [Berndt Museum of Anthropology, The University of Western Australia].